How big can America get before its political system starts to buckle? By 2060, the foreign-born will make up 18.8 percent of the U.S. population, up from next year’s 13.5 percent, according to new estimates by the Census Bureau. Up to now, the highest percentage of total residents who were foreign-born was 14.8 percent, in 1890. The Census Bureau predicts the total U.S. population for 2060 will be 416 million, up from today’s 321 million. Immigration, which will account for 47 percent of population growth next year, will account for 82 percent of growth by 2015, as the number of births flattens out. Without immigrants, America would become top-heavy with retirees complaining about understaffed Walmarts and hospitals. • Can our rigid two-party system survive a growing electorate—and how far will the Democrats and Republicans go to preserve their duopoly? • Can any candidate win more than a slight majority of this growing electorate? No candidate has won more than 53 percent since the number of voters in a presidential election first passed 100 million in 1992. • Is there a limit on how many constituents can reasonably fit into a congressional district? Political analyst Sean Trende, arguing for the first expansion of the House of Representatives since 1912, writes, “Today a representative answers to over 700,000 constituents, well over 10 times the number of constituents deemed appropriate by the First Congress.” If the Census projections are correct, and the U.S. population increases by 30 percent by 2060, each member of the House would represent more than 900,000 constituents. Because gerrymandering ensures that most districts are heavily weighted toward one or the other major parties, that means an ever-growing number of Americans stuck in districts where they’re perpetually on the losing side of elections. How will that affect people’s views of the legitimacy of Congress? • How far apart can states drift in terms of demography and political views before they find it impossible to cooperate on national issues? 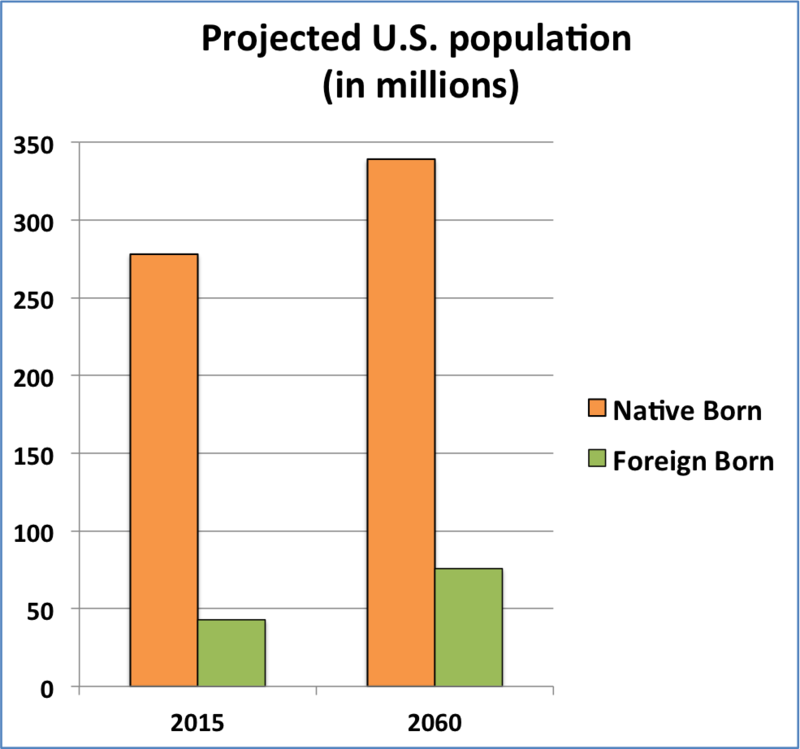 The Census projections on the foreign-born population mask wide variations among states (the agency does not make state-level projections). In 2012, the foreign-born made up more than 20 percent of the population in California, New Jersey and New York but less than 3 percent in Mississippi, Montana and West Virginia. These states may have radically different views toward the foreign-born, making any kind of consensus for immigration policy impossible. • Similarly, America’s growing population will not be evenly distributed. Some states will become almost entirely urbanized, while others will remain predominantly exurban and rural. Can they reach a consensus on federal spending priorities and on the best way to provide health care and education? • The likely concentration of population growth in major urban areas, including several in the South, will also make the U.S. Senate even less representative of the total population. Currently, California has 66 times the population of Wyoming but both states have the same voting power in the Senate, and political scientist Larry Sabato writes, “Just 16 percent of the U.S. population elects fully half of the Senate. When you take into account the 60-vote requirement for many critical pieces of legislation, a mere 11 percent of America’s population elects the 41 senators needed to stop action.” Is there an imbalance big enough for California, or Texas, to demand reform? "Not everything that is counted counts, and not everything that counts can be counted." This story is about counting people and feeds into the population control mentality that has become part of our political narrative. But what seems to be overlooked consistently in the North American/North Atlantic Catholic narrative is the fact that something more important is needed for our political system to remain cohesive. But it is not the numbers of people, it is the social and political context that may be the source of a political system that will 'buckle' or survive. Ironically, what is overlooked, and I suspect because it is not part of that North American/North Atlantic Catholic narrative is the experience of the Southwestern United States. But it must remember that this North Atlantic Catholic Church is only one of three Catholic cultural/political models that exist within our borders, as noted by the late Cardinal Avery Dulles (of happy memory) in 1988 or so. We are the inheritors of Catholicisms good stuff and bad stuff. American history lessons are filled with the Black Legend of Spain as created by the English and Dutch. But what is ignored is that it is the contribution of the Catholic Church in Latin America, which included and still includes the Southwest United States. It was in this region that the internal debate about human rights, and who is 'human' and deserves such rights was fought in the Great Debate at Valladolid between Juan Sepulveda and Barolome de las Casas. As a result many laws developed over the years and centuries that not only gave recognition of human rights for the Indigena (First Nation peoples) and their/our Mestizo progeny, but that recognized specifically the right to keep property, language, culture and religion. THAT is what made California a place of relative stability over the past century. As much as multiculturalism may be decried by some, it is what has made our region flexible and allowed for cultural adaptation -- not without friction, but with so much less friction than in other places in the world where you have a convergence of races, cultures, languages all contending for the simple right to live. It is not the numbers that will cause our political system to collapse, it will be the inflexibility of a form of governance that is not respectful of the rights and responsibilities of the people and for the people as has been embedded in the political culture of California. It is thanks to the internal debate within the Catholic Church that this has come about, but a very specific debate that the Church in Spain engaged. And perhaps that is why it is ignored by all but the few. Mary Ann Glendon Professor of Law has written extensively on this as have others. It is in part this influence among Latin American peoples that made possible the UN's Universal Declaration of Human Rights 66 years ago -- that is OUR inheritance from the Catholic Church and Spain -- the good the bad and the ugly. Fearless self-reflection is how this came about. It is not the numbers of people, it is the social and political context that may be the source of a political system that will 'buckle' or survive. We're being strained in California, but we're holding our own. It is the influence of folks from the other states who come to our state and are not familiar with or amendable to our political history of social, cultural, and economic adaptation that politically keeps us viable IMHO.